Operation Heal Our Patriots 2017 Begins! The first group of military couples arrived May 28 for the first week of the 2017 Operation Heal Our Patriots season. After flying through snow and heavy clouds, the season's first group of military couples has arrived at Samaritan Lodge Alaska. Memorial Day weekend marked the start of the Operation Heal Our Patriots 2017 summer season as the first group of military couples arrived for a week of marriage enrichment training at Samaritan Lodge Alaska. Retired military chaplain Jim Fisher led a special remembrance ceremony on Memorial Day to honor U.S. military personnel who have given their lives in defense of the nation. Retired General Jim Walker (front right), executive director of Operation Heal Our Patriots, raised the flag this morning and set it at half-mast alongside Civil Air Patrol cadet Paul Quebman (front, in unform) as Week One’s nine couples saluted. Quebman, 16, is an Anchorage high school student serving this week at nearby Tanalian Bible Camp. 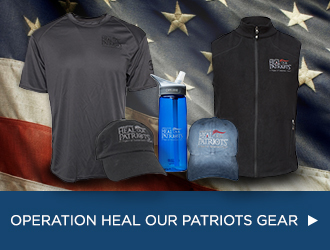 This is the sixth season of Operation Heal Our Patriots since its start in 2012. Beginning this week, and for the next 16 weeks, couples are scheduled to arrive every Sunday at Samaritan Lodge for a week of Biblically based marriage enrichment. 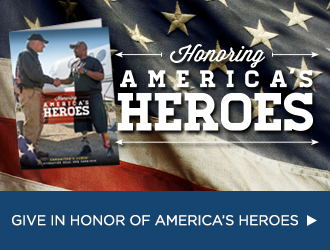 Nearly 160 new military couples will join the Operation Heal Our Patriots family this summer. Husbands and wives get to bond with each other and build friendships with other couples as they fellowship at the lodge and take excursions into the pristine wilderness surrounding Lake Clark. Retired military chaplains conduct daily classes and devotions and are available for confidential spiritual counseling. Many weeks of preparation culminated into this weekend. The most important thing now to do is pray. As our first couples arrived at Samaritan Lodge from all over the United States, our dedicated staff and volunteers excitedly greeted them. They await to see what God will do in these wounded lives and marriages. Nearby residents joined Samaritan Lodge staff for a hero’s welcome. Our newest military couples arrived May 28 for the 2017 season of Operation Heal Our Patriots! Over the past five years, Operation Heal Our Patriots has welcomed more than 685 military couples to Samaritan Lodge Alaska for marriage enrichment. While in Alaska, more than 300 couples have rededicated their marriages to God and each other; 320 individuals have been baptized in Lake Clark—many of them having received Jesus Christ as Lord and Savior only hours or days beforehand. But the ministry that happens in Alaska is only the beginning of our commitment to our military couples. Year-round follow-up through the project’s aftercare program includes regular contact and encouragement with aftercare chaplains, prayer support, help finding a local church, a reunion open to all participants, regional advanced training events, and crisis care. Please pray for the combat-wounded veterans and spouses coming to Samaritan Lodge, for the Samaritan Lodge staff and volunteers, and for our military chaplains teaching and counseling with couples. We look forward to what God will do this year! Chaplain Dan Stephens greets new arrivals May 28 at Samaritan Lodge. This is Week One of the 2017 Operation Heal Our Patriots season. Retired military chaplains offer confidential counseling to couples and individuals throughout the summer.